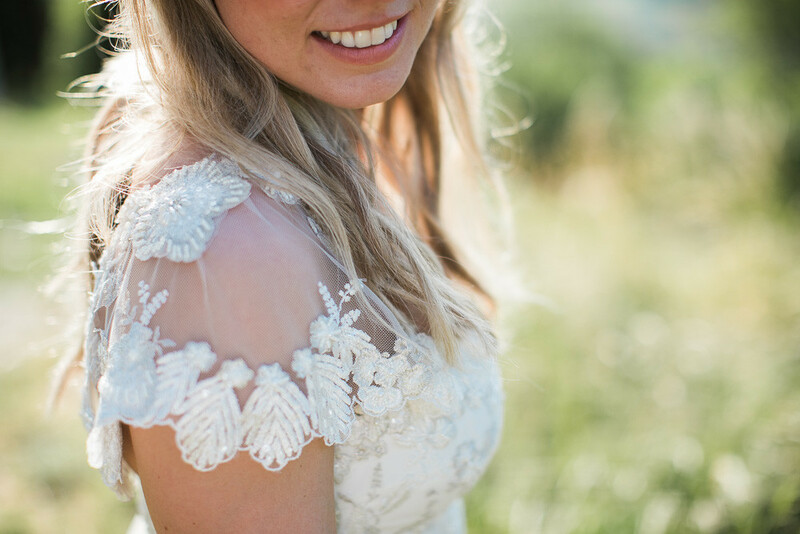 Steph The Bride: I found my dress back in 2013 when Adam and I were living in New York. My parents came over to visit us and Mum and I decided to do a little dress shopping. I didn’t think I was going to find anything but then I tried on the Daphne by Sarah Janks. I came out of the changing room and my Mum burst into tears! From there on in I knew it was The One. The comfortable sleek shape with some pretty vintage detailing really enabled me to ‘feel like me’ which was so important to me on the day. My hair was done by one of my best friends Rachel – who, being the multi-talented superstar that she is, designed all of our stationery as well. Becca Harrison, again another friend and sister of my bridesmaid Clem, did my make-up getting that perfect between natural but with a bit of glamour which is exactly what I had asked for. As Adam wears a suit to work everyday he really wanted to wear something on our big day that made him feel extra special so he had a bespoke suit designed for him by Thom Sweeney. As cliché as it sounds, I can honestly say he has never looked so handsome! It was definitely worth the investment. I found our magical wedding venue – Castelnau des Fieumarcon – in a magazine back in 2010. 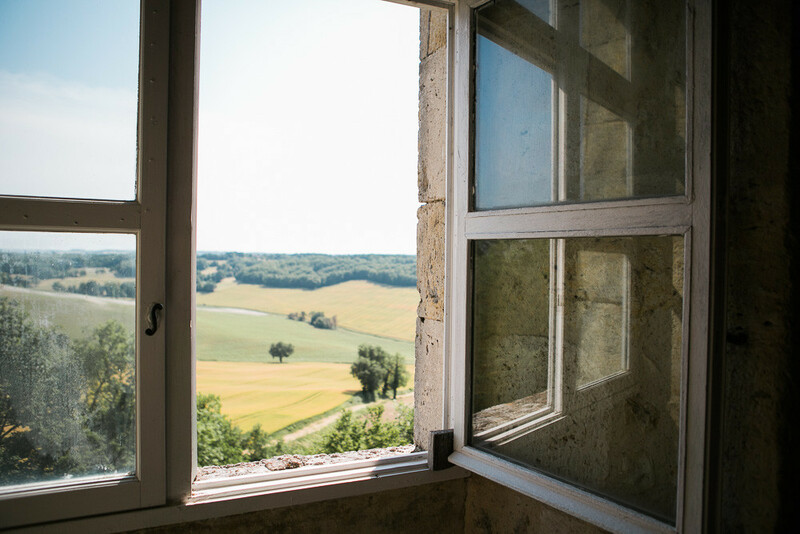 Adam and I weren’t even engaged; in fact we hadn’t even talked about it, but as I read about this beautiful 13th century village in the rolling French countryside that you could hire in its entirety I instantly knew “this is where I am going to get married”. Some three years later after Adam had proposed on the ski slopes of Lake Placid, I pulled out this scrappy piece of paper in our Manhattan apartment and we picked up the phone and called Didier who manages the venue to see if it might be possible to make our dream a reality. With Didier, and later Anneli’s, fantastic help and guidance we were convinced that this was the place for us and booked our wedding, whilst still across the pond…without even seeing it! We were not disappointed when we finally did visit. It’s a truly breath taking venue. 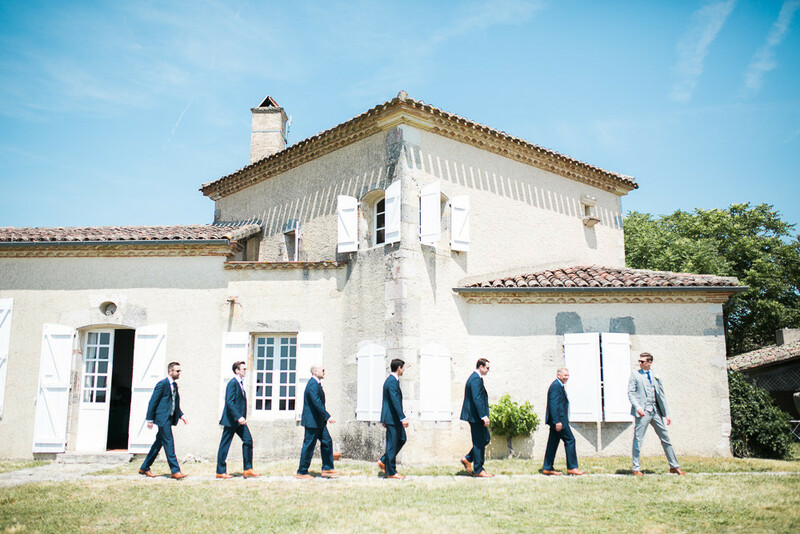 From the quaint chapel to the exquisitely designed houses that accommodated our wedding party and family, to the monumental banquet hall and stunning archway entrance, we felt we really had stumbled on a piece of French heaven. The venue really does speak for itself. So we wanted to keep things simple and have a natural colour palette. We didn’t set out with a strict colour scheme in mind but settled on light French grey, with natural cork and metallic gold to accompany. 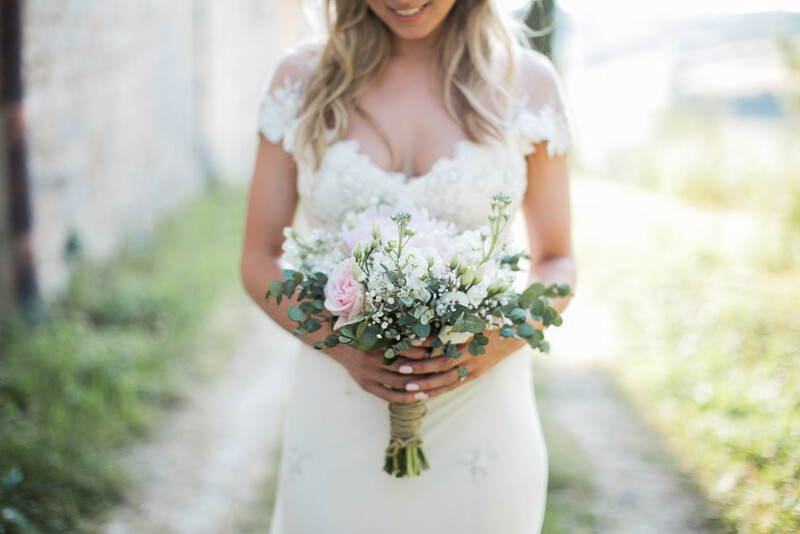 Beatrice, a local florist in Agen created our bouquets and centrepieces using flowers that were in season…which fortunately for us were Peonies mixed with gypsophila. 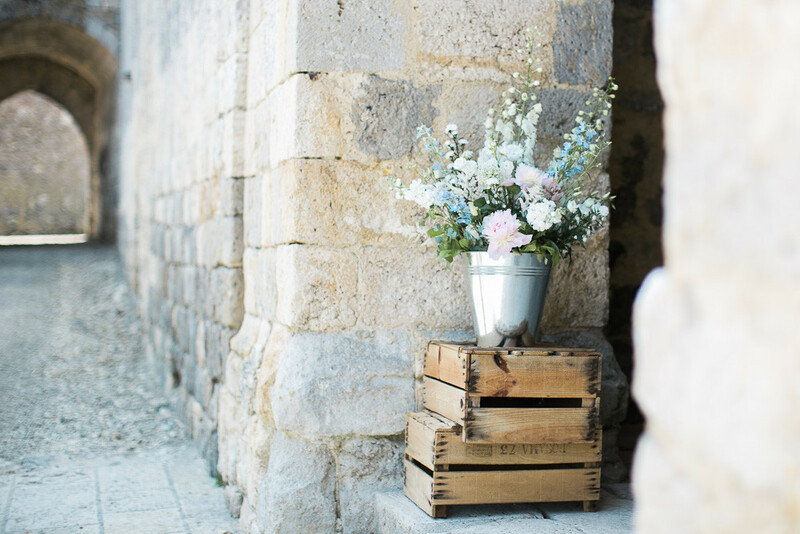 As we were engaged for 2 years before getting married it gave us time to collect a lot of DIY elements, one of which was small antique blue bottles, which we filled with gypsophila flowers on the day. Our favourite element of décor was by far our handmade Wine Cork Board for our table plan. It was a labour of love that so many of our loved ones had played a part in. The frame was borrowed from my brother and sister in law, the corks were collected by all our friends and family, the idea was down to Holly (sister in law to be) and the making of it was part of a pre-wedding craft day with my mum, mother-in-law and Holly! So worth it as it was so unique! I really struggled to find bridesmaid dresses in light grey. The dresses I went for were from BHLDN, a U.S. based website. Whilst I was really loved them, I did forget when ordering about the customs charge that gets added when you order from the U.S. to the UK which meant I had quite the ordeal to get them out of the post office! Totally worth it though as my ‘maids’ looked beautiful! The Groomsmen wore navy and grey to tie into Adams suit, these were bespoke hire suits from Jack Bunneys and our flower girls – Lila (niece) and Ivy wore pretty white crochet and tulle dresses from Monsoon. We gave our bridesmaids – The 3 C’s, Clementine, Caroline and Charlotte – ‘C’ bracelets to say ‘Thank You’ and the groomsmen had tie pins and personalized bottle opener all from Etsy. 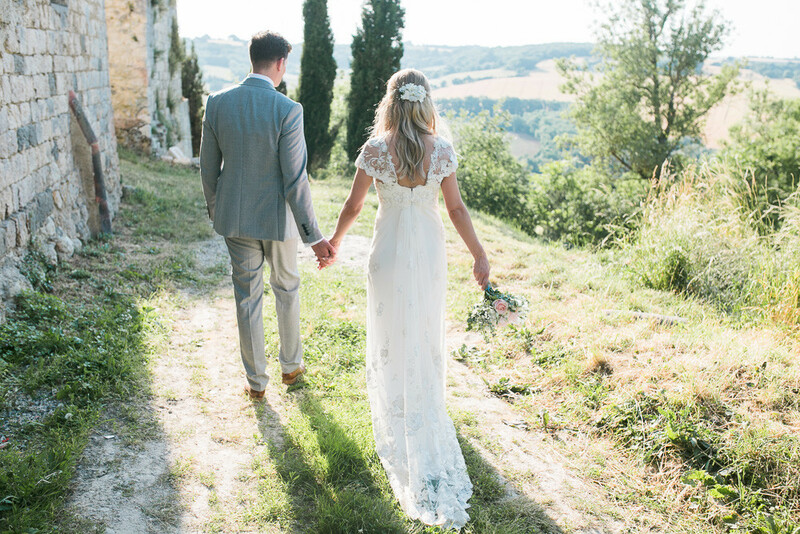 “Due to French legislation we had to sign our wedding register in England before arriving in France but we had an Anglican blessing in the chapel at the Castelnau, which was really special to us. It was made extra special by cousin Gavin James Burke singing for us while we signed the register. We’re really lucky to have a professional singer in the family and it was such a personal and lovely moment. For the speeches, we decided to break up the traditional toasts. My brother Ryan introduced us as Mr and Mrs McDonald for the first time and acted as Master of Ceremonies. My Dad did the father of the bride speech before the starter was served, Adam did the grooms speech at the end of the main course and Luke (Adams’ brother and best man) closed the show after dessert! Everyone seemed to really enjoy the way we did it…accept maybe for Luke who had to wait all night before his turn! As we were at the venue for the whole weekend we hired a sound system. Adam fancies himself as a bit of DJ so he wanted to make sure he had everything on hand to keep the party going. For the Champagne reception my mum put together a playlist of jazz, swing, blues with a couple of French classics from Edith Piaf as a nod to our stunning location. In the evening we had a 5-piece funk and soul band from Lyon who were incredible and got everyone on the dance floor. When the band finished at 1am it was then the turn of my cousin Richie on the decks to keep the party going. The food at our wedding was one of the areas we spent the most time deciding and debating on. Thankfully, it was the part of the wedding that our guests commented on the most as it was absolutely outstanding. Our caterer, Nathalie from Un Traiteur en Gascogne was a total superstar always ensuring guests had a full glasses and full stomachs. As we had planned a 2-hour Champagne reception we wanted to ensure our canapés would keep our guests going so we put on quite the spread! From traditional passed canapés including foie gras, local cheese, melon and ham to an atelier stand with freshly cut local cured ham and cheese and a plancha station freshly cooking and serving skewers ranging from scallops, to duck breast, chicken to prawns in front of our guests. For the starter we had a choice of goats cheese and beetroot salad or a petite quiche Lorraine. For Main, it was either local Magret de canard (duck breast) or fillet of Dorade (Sea Bream). We had a trio of desserts including a pistachio crème brulee, chocolate entremets and a Carpaccio of peach and strawberry. We decided against a wedding cake and went for a tower of macaroons instead. As I work in PR I am used to working with a lot of photographers and so was quite fussy over the style I wanted. 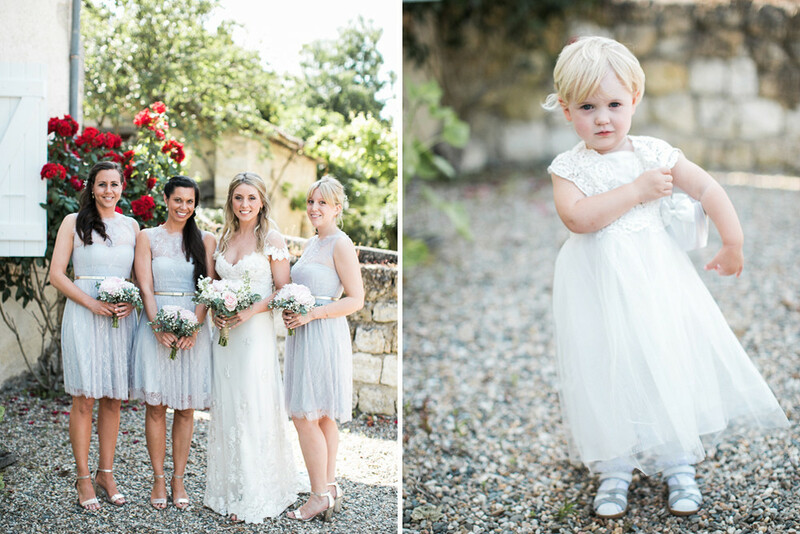 Also getting married in France and not speaking French we were worried that we might not find the right photographer that understood exactly what we wanted. Yann from Lifestories did not disappoint. Not only did he produce stunning photos really encapsulating the pastel colours and style of the venue but he also was such a joy to have with us on the day and at the pre-wedding drinks the night before. We both agree it was one of our best decisions. 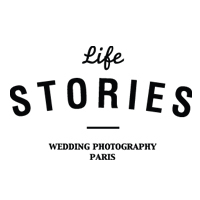 When we contacted Yann about our photography he informed us that Lifestories had also started videography too. So, we were delighted to be able to have a duo of Yann and Vincent who had such a similar vision for the day. Deciding on whether or not to have a videographer is a decision that I know many couples debate. We honestly recommend having one. It’s impossible for you to be able to see and take in everything on the day and having someone bring your wedding story to life is really special. Planning a DIY wedding in another country is not for the faint hearted. Especially when you don’t speak the language! Although we had a 2-year build up to our big day we probably underestimated how much work there was to get the kind of wedding we really wanted. Despite the crazy levels of ‘wedmin’ it was 100% worth it. Having 3 days of non-stop eating, drinking and celebrating with our closest friends and family was something that we could never have imagined would be as fabulous as it was. Many of our guests described it as a Wedding Festival! 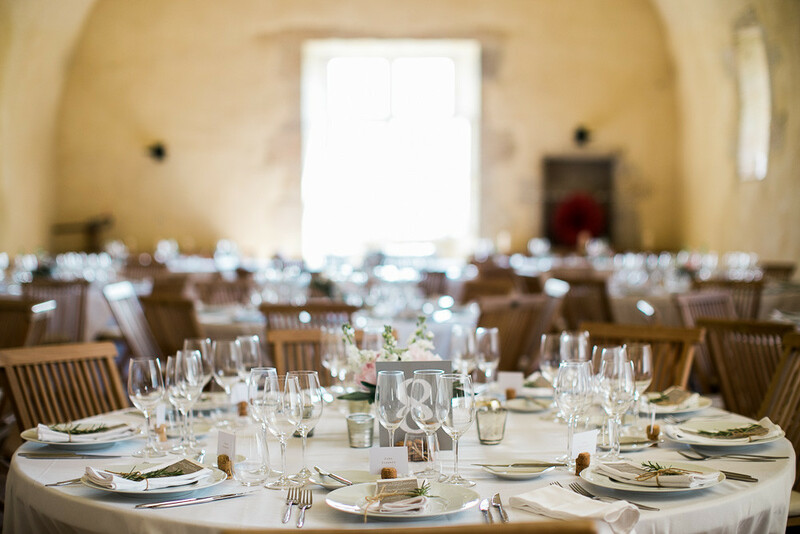 We decided against a wedding planner and did the organisation and planning ourselves – with a lot of help from Anneli (from our venue) and Nathalie (our Caterer). We don’t regret this decision as we had the time to build up our DIY supplies plus an army of willing wedding party helpers, including an events organiser for a bridesmaid (Charlotte). If you’re shorter on time it might be worth the extra pair of hands. Just because its overseas doesn’t mean you can’t find clever ways to make your money go further – I collected antique bottles, bought cheap candles from Ikea and dressed them with rustic string and collected candle votives over a year period to dress our tables – picking up some bargains in the January sales! Working in PR and being accustomed to running events I drew up an event plan with hour-by-hour details of what needed to get done and by whom. Despite much mocking from my friends and family when they first saw it we honestly would not have had such a great time in the build up if we didn’t have it. We were able to ease the stress and take each step in our stride rather than running around trying to do everything at once. It was a lifeline that I’d highly recommend everyone having. Hi. We are trying to get hold of the lovely B&G as we just booked our wedding at the same venue and are keen to chat to them about their experience in a little more detail.